Review a selection of Gray Family Chiropractic patient testimonials below and please email me or contact the office if you have any questions. My son Ben Pierce is 15 years old and has been a patient of Dr Grays for about 8 years. These xrays show Ben on the left right after he fell from the monkey bars at school and was in terrible pain! As you can see his spine is turned and pelvis was twisted. The xray on the right shows Ben’s spine after chiropractic adjustments with Dr. Gray. 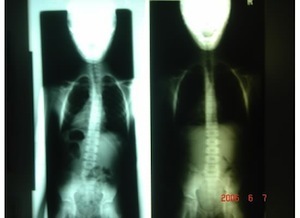 It’s a huge difference and a perfect example of how chiropractic adjustments really DO help!! Many doctors just want to give pain medicine that will only mask the pain in these injuries. Dr. Gray actually can fix the issue by getting to the root of the problem. Ben’s spine is now straight and he is doing so much better. Ben also loves soccer and basketball. Ben has seen Dr Gray for knee injuries, shoulder injuries, and for headaches (from all the times he played soccer and did a “header” with the ball). I cannot imagine life without Dr. Gray. I have also been a patient for ten years and she has helped me tremendously with my migraine headaches, as well as with neck and back pain. Dr. Gray has also helped my niece who played Rugby at UNC CH. I don’t think all parents realize how these sports can often hurt our kids (concussions, neck, should and back pain). Having these adjustments now as children and young adults can prevent a lifetime of possible pain and suffering. I trust Dr. Gray with my son’s health and my health and cannot say enough wonderful things about her and her staff! ~ Tye Pierce. My family and I have been Dr. Gray’s patients for over five years. I started seeing her and taking my two boys, one who was having sensory issues. Dr. Gray impressed me right away by going above and beyond the regular appointment and conducting several assessments that gave us valuable information. She also referred us to an occupational therapist. My husband, who was having back issues and did not “believe” in chiropractic care, finally decided to give it a try after seeing the tremendous benefit the rest of us received. This non-believer, who thought chiropractors did not work, now comments when he is “out” and makes himself an appointment. I know when my kids ask for an appointment that it make them feel better. Chiropractic care has helped all of our ailments through the years. The other day I was unsure if an adjustment would help my neck since I had slept wrong. I thought my problem was muscular and would simply take time to resolve. However, I was in so much discomfort that I called Dr. Gray and she fit me in that morning. Dr. Gray explained why it chiropractic care would help and what to expect. I was pleasantly surprised with the relief I experienced. I greatly appreciate Dr. Gray’s honesty and knowledge about how chiropractic care can help and whether other resources are needed. She is also careful to tell us when we only need maintenance care and don’t need to come in so often. I truly sense her honesty, caring and dedication to her patients. If you want a chiropractor who is honest, knowledgeable, caring, genuinely nice and dedicated to her patients’ healing, than I recommend making an appointment with Dr. Gray. ~ Kerry L.
Me and my three children have been going to Dr. Gray for a few years and she has truly helped us live pain free. Before seeing Dr. Gray, I was in constant neck pain and occasional back pain and now I am pain free. I’m a pianist and composer and spend several hours at the piano and computer every day and I truly could not do these things without Dr. Gray. My children love to go to Dr. Gray, and ask to go when they are in pain or feel any discomfort. As my two boys have gone through their teenage years, they have experienced back pain during their growth spurts. Dr. Gray has always helped them through this time. I am grateful for Dr. Gray! Kristen A.
I had been suffering from sciatic and back pain for more than a year. I tried exercise, ergonomic changes, diet, and my medical doctor with no relief. Then a friend referred me to Dr. Gray. I was skeptical arriving for my first appointment but Dr. Gray asked detailed questions, took a complete medical history and performed a thorough chiropractic exam. Before each adjustment we discussed what to expect during and after the treatment. Dr. Gray is Amazing! In just 4 visits my pain was gone. What a relief! My thanks to Dr. Gray and the staff of Gray Family Chiropractic for courteous, prompt, and efficient care and service. Mariann M.
I am a 75 year old and have had Chiropractic care for many years with Dr. Gray starting with sinus infections that she helped treat successfully. As age has crept up on me so has the aches and pains in my neck, lower back, and hips. These chiropractic adjustments have helped me tremedously. I believe I am in better health, able to do many normal activities that I could not do without incurring severe lower back and hip pain. But THANKS to you and your treatment/adjustments I am now able to have a bounce in my step! Thank you, Dr. Gray for helping me these many years. Louise B. We recommend Gray Family Chiropractic. I have been a patient since 1998 so when I became pregnant in 2010, I knew that I needed to make some extra time to come in for adjustments regularly as my body started changing and adapting for the new little person growing inside. Once our son was born, he began getting adjustments too from Dr. Gray. At 6 weeks old, he began favoring his right side, and needed a little straightening out. Now a very active 17 month-old toddler, we credit his happy, calm demeanor, healthy immune system and digestion, and tall straight posture to early chiropractic intervention. Leigh W.
I am a patient of Dr. Gray, and first visited her because of continuous neck and shoulder pain. Dr. Gray treated me and after the first visit I could hold my head up better and my shoulders back. My pain has subsided now and is almost completely gone. Kudos to Dr. Gray. I feel stronger and straighter after every visit and wished I hadn’t waited 92 years to seek out chiropractic! Jane H.
Ready to start your own journey to optimal health? Contact our Raleigh chiropractic office today!